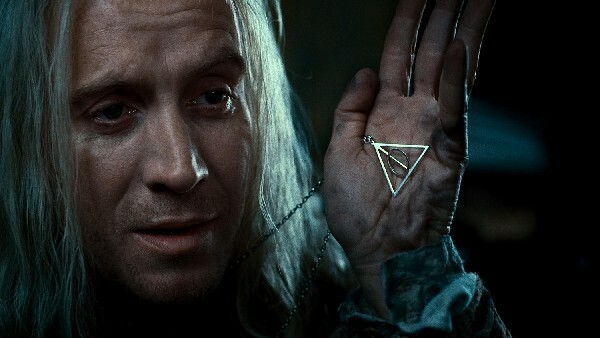 The Deathly Hallows symbol necklace is a faithful replica of the one worn by Xenophilius Lovegood in Harry Potter and the Deathly Hallows – Part 1. The shapes comprising the symbol, of course, represent the three Deathly Hallows – a triangle for the Invisibility Cloak, a line for the Elder Wand and a ring for the Resurrection Stone. Just above the Hallows symbol is a bright, translucent amber-colored bead that adds a touch of bling and keeps the necklace from just looking like a pendant on a chain. This is a fun necklace to wear while representing a series I love. The pendant looks fashionable with its simple lines, which make it coordinate easily with most outfits. I’m able to wear mine when dressed up, or with a T-shirt and jeans. It is just the right length, the same as Xeno Lovegood’s was in the film, and the circle representing the Resurrection Stone rotates like his did as well. The 22-inch chain has some weight to it, and is nonkinkable and adjustable to fit any neckline. The necklace comes with a beautiful black triangular-shaped display box with a clear front and mirrored back. There is a small clip at the bottom of the box which holds the Hallows symbol upright while on display. 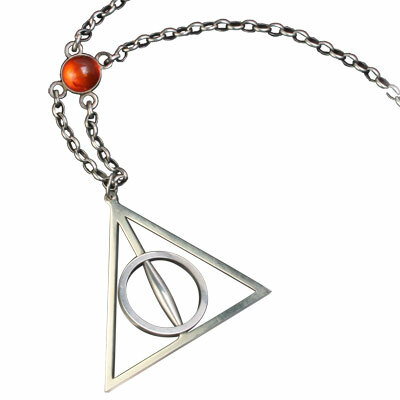 The Deathly Hallows symbol necklace is available at the WBShop Online. I hope to someday to add this to my collection! It looks so amazing!